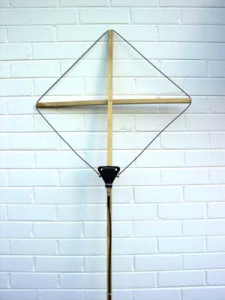 The test kit was walked at fairly constant speed from 20 to 60m from the antenna, to the side of the vehicle, and over a grassed clay paddock. Measurements were taken every 1s and distance interpolated over the set. 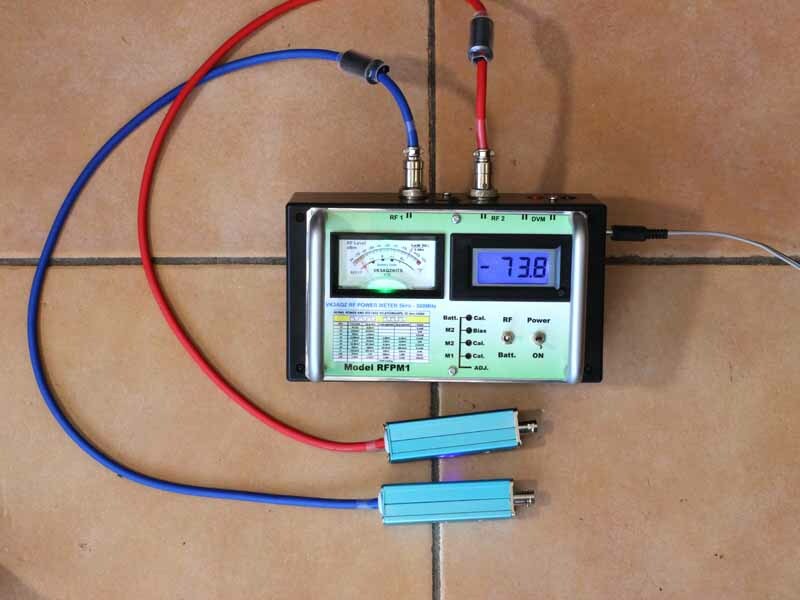 Transmitter output power was measured at 40W, and feed line efficiency estimated at 90%. 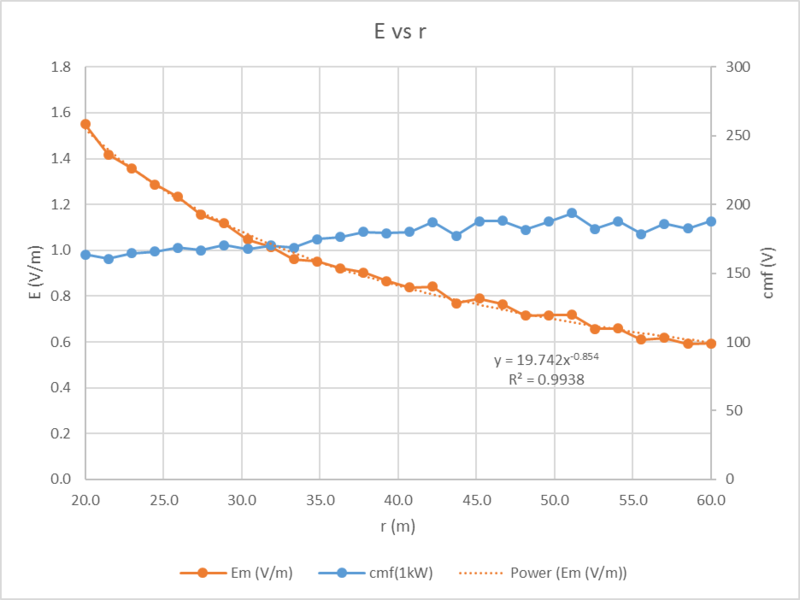 Above is a plot of the measured power and the calculated raw measured voltage. Above is the calculated E field strength after deducting ground loss using Norton’s ‘exact’ formula. Ground parameters are assumed to be 0.010,4. 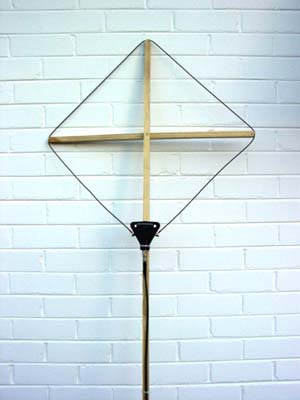 Also shown is cymomotive force (cmf) at 1kW. cmf(1kW) for a lossless short vertical is 300V/m. 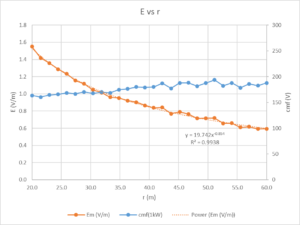 Above is the calculated efficiency based on calculated cmf. 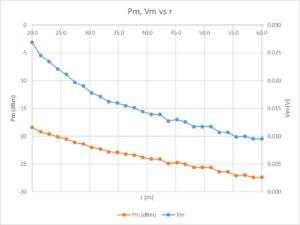 Efficiency implies Radiation resistance (Rr). 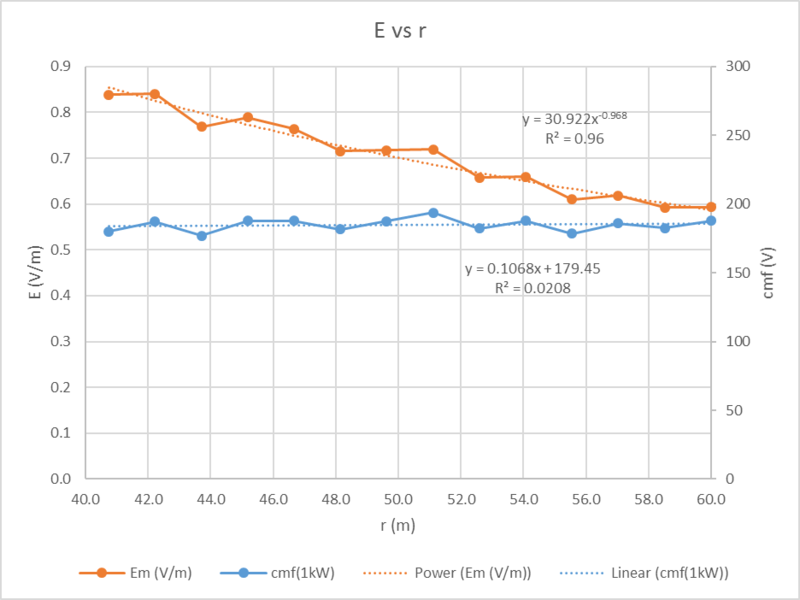 The trendline for E departs from the expected inverse linear relationship, the exponent of the curve fit is 0.85 rather than 1.0, and begs the question of whether near field is significant in at least some of the measurements. 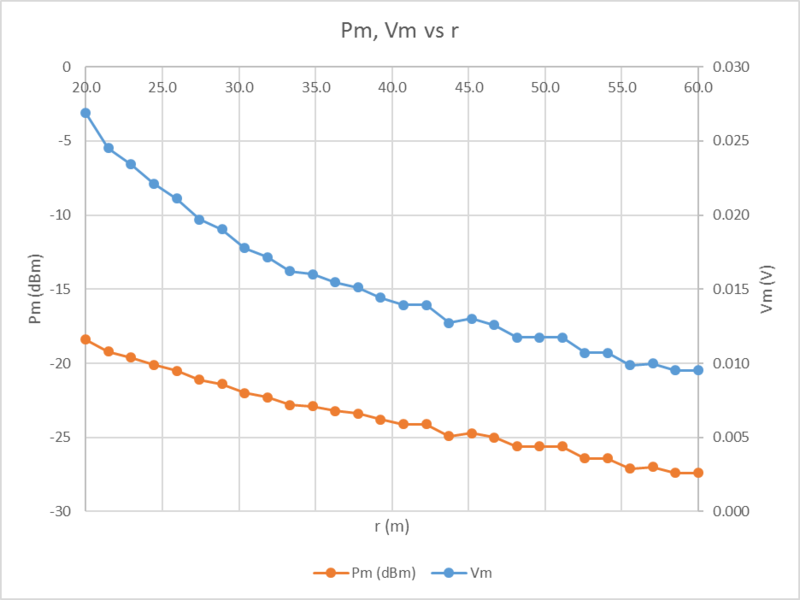 The following graphs consider only data for distance greater than 40m (approximately 1λ). 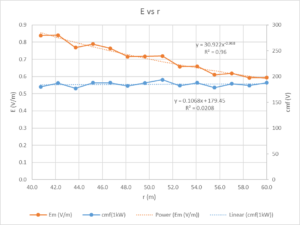 A curve fit to the data has an exponent of -0.968, quite close to the expected value of -1.0 for E∝1/r. 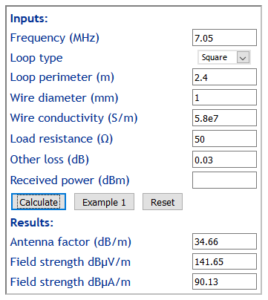 Above is the calculated efficiency based on calculated cmf. 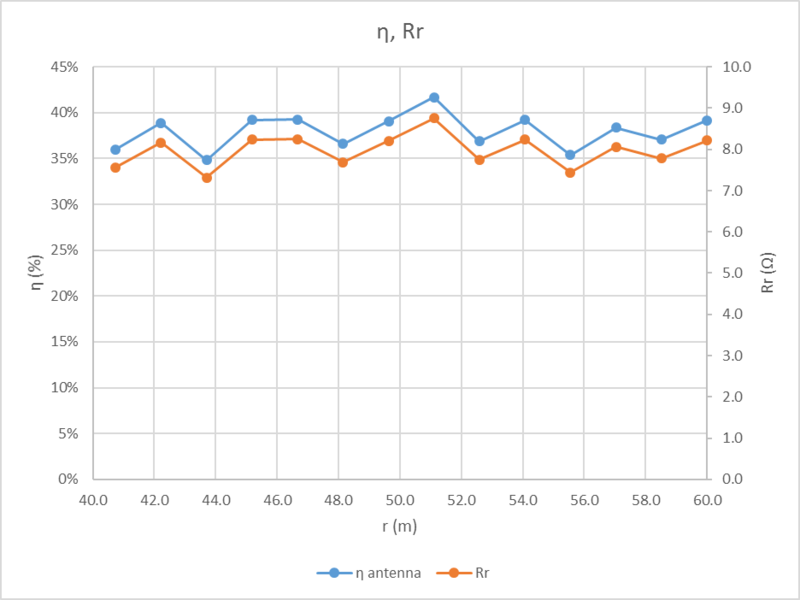 Efficiency implies Radiation resistance (Rr). R^2 is poor because there are few data points and the slope is quite low. Mean efficiency is 38.0% with a standard deviation of 1.9%. 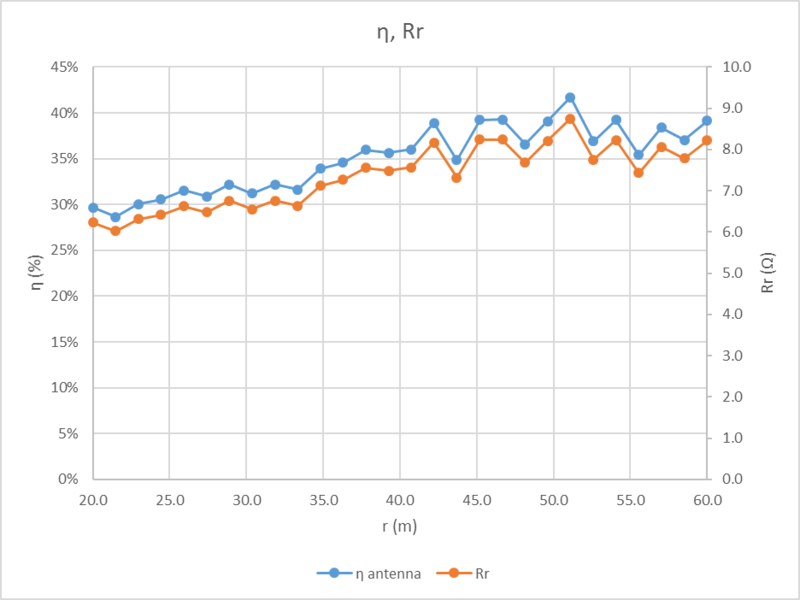 Keep in mind that this is not a full spatial survey, but a survey along one radial line from the antenna and it would be naive to assume antenna efficiency averaged over all azimuth directions is 38%. The method for interpolating distance does not seem to have introduced significant noise. 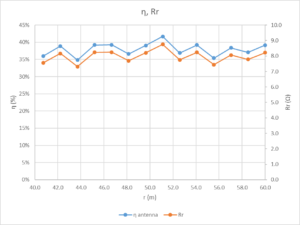 Measurements in the more distant are closer to expected and suggest that closer measurements were affected by near field. 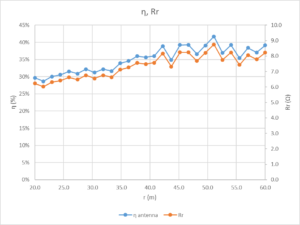 Results are sensitive to ground parameters, more so G than ε, and to some extent, the test is a measure of ground parameters which clearly need to be assessed separately.